Sometimes a dog just won't cut it as your go-to Fangs for Hire, but thankfully Far Cry New Dawn has your back, and this time it snorts. Nope, it's not another drug-addled pal to lean on, it's Horatio the boar, a brand new assistant to help you in battle that has all the qualities you love when the going gets tough. This sturdy little fellow excels in being quite the battering ram. He can knock shields from the enemy's grasp, use his special Pig's Endurance to get back on his feet when he's downed, and even go full red flag and take down anything in his path. Handy, right? 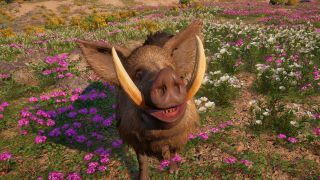 Well, if that appeals, here's how to unlock Horatio the boar in Far Cry New Dawn. In order to trigger Horatio's quest, you can either keep speaking to your scouts - the ones with the blue exclamation mark icon above their heads - until they drop you a tip on the little piggy's whereabouts, or you can head up to a place called Elsinore Farm, which is way to the north of Prosperity, just northwest of The Pantry outpost. Getting here will trigger the 'To Love a Boar' quest, which will introduce you to Horatio. He's hidden inside a shed on the farm, protected by Highwaymen arguing about the fact they've lost the key to Horatio's jail. You'll need to take them all out and shoot the padlock on the shed to free Horatio and let him join the fight. When everyone is dead, there's nothing left to do but give your new piggy pal a pat behind the tusks - you might even find he's gone to lay down by the corpse of his former owner - and then he'll be added to your roster. Turns out the Highwaymen were going to eat him, so you've literally saved his bacon. Nice work, Cap.